The last time I was lucky enough to have a writing residency was a few years ago, at the Little Blue Hut in Tankerton. The Little Blue Hut was all about space, the quiet of the hut, and the sea stretching to the horizon. The environment crept into all of the work I produced at the time, but it was the mental and physical space that was the most important part of the process. This residency is very different. As I said previously, on my first visit I was surrounded by possibilities, ideas of things I could use as inspiration. And I've found this has continued, each time I visit I’ve been struck by something new. 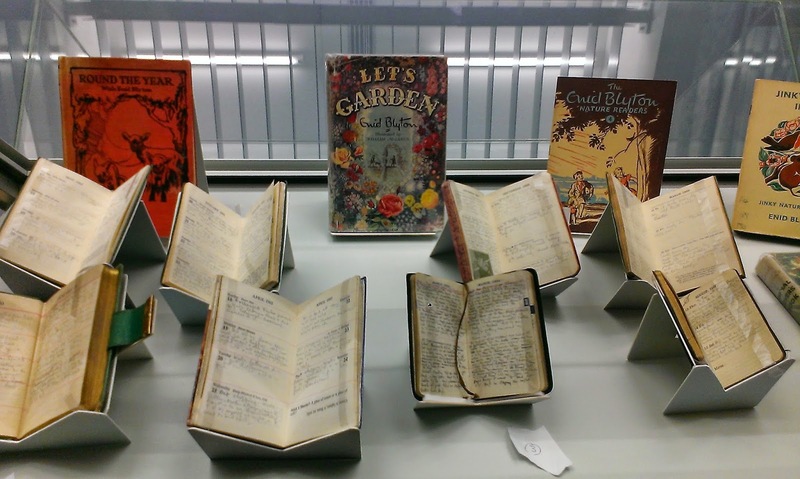 A great inspiration recently has been the Enid Blyton exhibition, and it had a double impact for me. 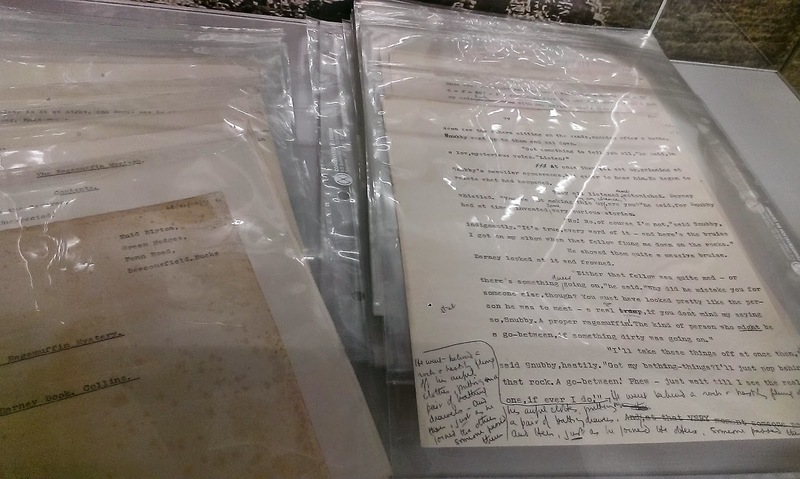 I’m always fascinated to see the way other writers work, and seeing her actual notebooks brought home the fact that all writers have to put the long hours in, even someone as prolific as Enid Blyton edited and refined her work. And being reminded of that process always gives me hope, reminds me that all writers write crappy first drafts and have to edit. It also took me back to my childhood. I was an avid Enid Blyton reader, and remember devouring the Famous Five by torchlight under the covers at night, I wished I could go away to a school like Malory Towers and have midnight feasts, and go up the Faraway Tree to a different land for a day. Being surrounded by images from her books, suddenly I was six and seven and eight again. The past is something that many writers revisit, we are the sum of our experiences, and those memories are a treasure trove that we can plunder for our writing. Even if we don’t write about our past directly, then it still sneaks into the worlds we create in one way or another. The exhibition also got me thinking about perceptions and the effect of social context. I’ve recently reread some Enid Blyton, and many of her books seem littered with casual racism and sexism, her characters are often stereotypes in a way that would be criticised today. Anne in the Famous Five is pleased to be told she was like a good little housewife, whereas George wants to be a boy, because life would be much more exciting. But then Enid Blyton was a sum of her experiences and the world she lived in, in the same way contemporary writing is written within today’s social context. What we now perceive as the various –isms were perfectly acceptable to most people at that time. 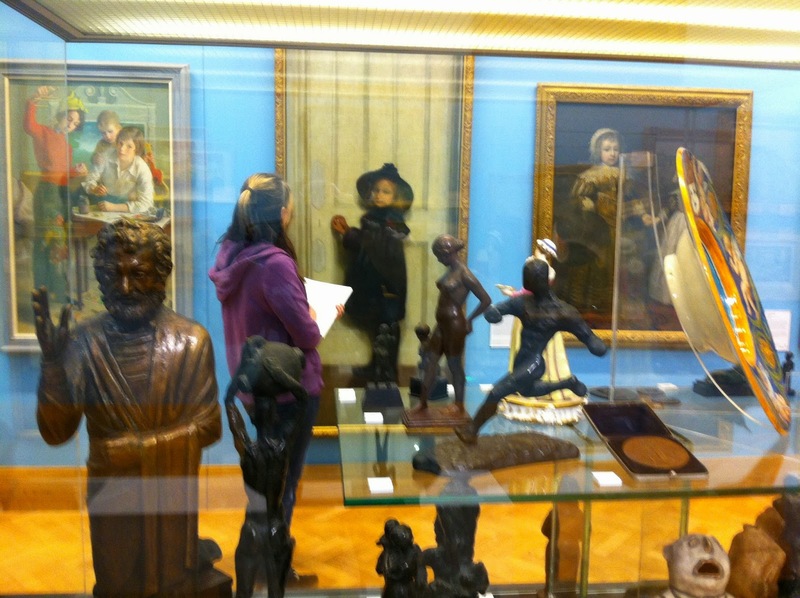 This all adds to the impact this residency is having on my writing, for me, my visits to the Beaney have been less about sitting and writing, than taking in ideas, scribbling notes and taking photos, these have been accumulating into ideas. There’s also something about the museum and it’s exhibits that have made me look at the way I write, I've found myself researching more about Egypt, about gemstones, I've found myself exploring new ways of generating writing, looking at other writers that have been inspired in similar ways. So far, the residency is really shaking things up and showing me new ways of looking at things, which has to be a good thing. I felt a bit like the proverbial kid in a candy store. As I began wandering around the rooms, the variety of the exhibits hit me hard and fast, and the possibilities of inspiration seemed to fly through the air. There were butterflies, artists’ books, tins, paintings, beetles, crystals, a lion skin, and a letter written in blood. There were posters, doll’s houses, kaleidoscopes, fossils, shells, birds, and a mummified cat, to list but a few things. So many possible starting points to write. The temptation was to latch onto something, pin it down, produce my own exhibit. But I know from experience, that’s not the best way to work. It’s better to absorb things, let them ferment, give them the freedom to develop in weird and wonderful directions. One thing that struck me is how the exhibits resonate off each other, like words do in a poem. If you stick two words near each other in a poem, unseen connections are created between them, a certain tension, they bring out different connotations in each other. It’s a technique that many poets will use. 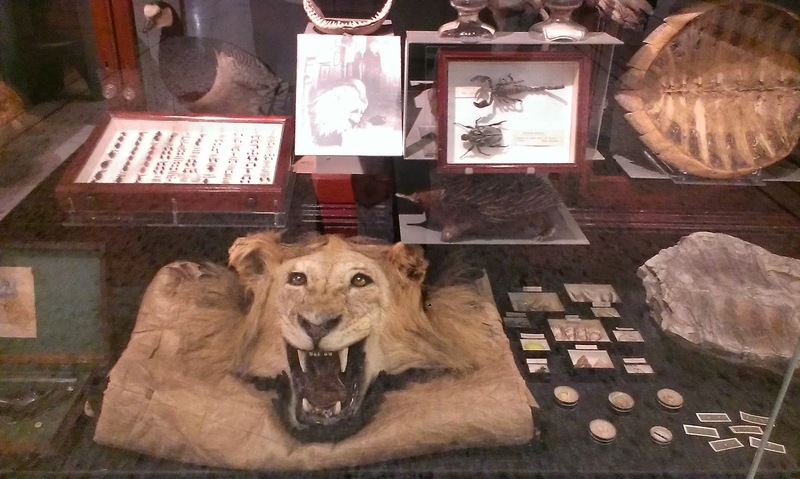 And this was present in the collections in the Beaney. One room has the exhibits organised by colour, which means you can see an agate ornament, a piece of jasper and a muskrat in close proximity, or butterflies, beetles and crystals side by side. It’s a really fascinating way of looking at things, and reminded me how the context of objects (or words) can completely change how we see them. I’m also fascinated by people, I love to sit and people watch, and I think watching them as they look around the exhibits is interesting. I sat in the Study and did this for a while. Looking through glass cases into the other room meant the people staring into those glass cases appeared to be exhibits themselves. I heard one very small girl point at the lion skin and say to her carer when I was little, I was scared of that, but I’m not any more. Then a bit later that used to be alive, but it’s dead now. Why is it dead? This question was fielded nicely by her adult saying that’s a question for another day, here look at this. I feel the place is bubbling over with potential at the moment, and I can’t wait to see where it leads me. Oh… and even after spending ages wandering around, I still couldn't find the actual ‘Armchair’. I was very excited this week to hear I’d been successful in my application for the Armchair Artist Residency at the Beaney House of Art and Knowledge in Canterbury. It’s an amazing building in the centre of Canterbury, and houses the library as well the museum. I learnt the value of residencies a few years ago when I occupied the Little Blue Hut for six weeks. When you’re busy with the daily slog of work, house, pets, plus trying to squeeze in quality family time, it’s often hard to find the time to be creative, it’s often hard to justify taking time out from necessary chores. Residencies give space to think and feel, and they give a justification for ignoring other demands, these things are incredibly valuable to creativity. I took part in one of the Wise Words Festival’s writing workshops a couple of weeks ago. I thought it would be fun (it was), I thought it would be interesting (it was) and I thought that I might get some writing out of it (I did). What I didn’t expect was that I’d be reminded of something so fundamental that I can’t believe I’d forgotten it. The wonderful Sarah Salway had us all gathered around a bench in the garden and we began by doing some free writing, the kind of thing I do fairly often. But then we began a more structured exercise, focussing on our surroundings and listing anything that impacted on our senses. Between us we soon built a huge long list of concrete ‘things’ that were in the park. (On a side note, it was interesting to see which senses were predominant; sight and sound registered most with the group). Sarah set us the task of coming up with metaphors for some of the objects. While trying to think of creative and imaginative metaphors, I started to struggle to think of ANY metaphors that seemed even vaguely appropriate. I could honestly feel the tendrils of my brain searching and stretching to find them. Some of mine were flowers are farewell kisses, the mud is an empty promise, the grass is a whisper, the sunlight is a flicker of tomorrow. We also generated poems using these, and played around with garden memories. 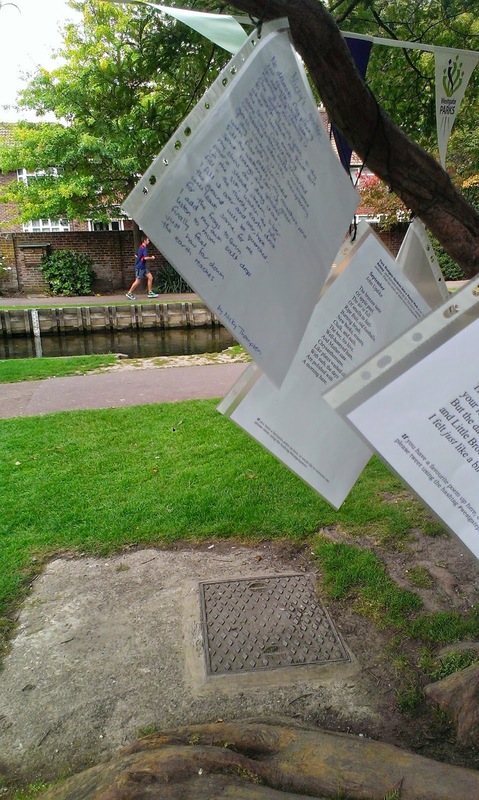 At the end of the workshop we tied our poems to fences and trees around the Westgate Gardens. It was the first time in ages I’d done these kind of exercises, and I could feel it! I had forgotten the benefit of making myself write things I wouldn’t usually, I was also reminded of the power of writing in different locations. It’s far too easy to get caught up in a ‘this is my desk where I write’ or get stuck in a comfortable way of writing, so it’s good to stretch those imaginative muscles and exercise from time to time. I was impressed last time I saw her, and this time, even more so. Last Friday she had musician John Sampson on stage with her. He plays various wind instruments, ranging from Sopranino recorder, to a Chinese woodwind instrument that I’d never heard of. He seemed a genuinely nice guy, with a quick witted sense of humour delivered in his Scottish accent. Listening to poetry live, especially in a great performance venue like the Gulbenkian, is always powerful. Hearing a poet lift words from the page, and project them out into the world, adds a new dimension. When we read poetry in a book, the formatting is important, the shape of the lines, the white space on the page change how we interpret a poem. When listening to poems read aloud, it’s the silences that affect us, the inhalations, the exhalations, they are as important as the spoken word, they give shape and definition, they give us space to reflect, to absorb what’s being said. Silences around music are important too. A silence provides an edge for us to collide with. I used to play in school orchestras and bands, and my favourite moments in a performance were those split seconds of silence, when the music has stopped and the moment seems to hang in the air, just before the applause starts. Combining music and spoken words multiplies the effect of these silences. The spaces between the words and music become deeper and more intense, and by contrast so do the words and music. 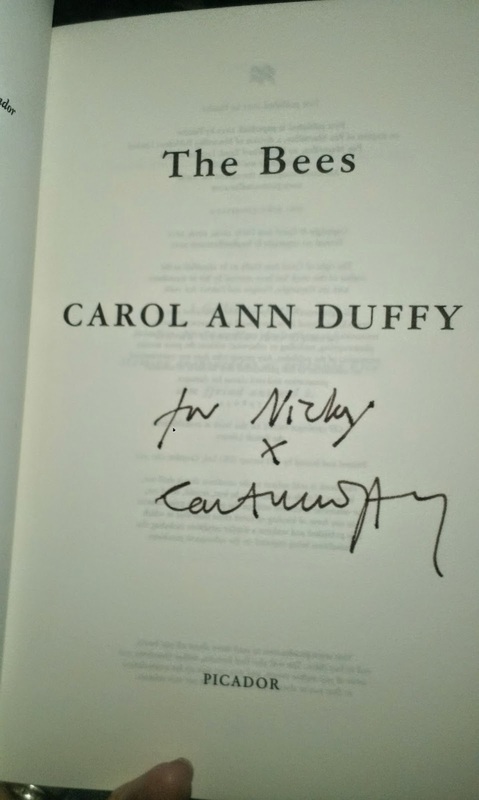 Carol Ann Duffy’s performance was full of those moments of silence, concentrating the resonance of her work. I am in awe of people who have that kind of power over words. Using everyday language she gave me goosebumps, tingles down my spine and choked me with tears. It reminded me of what’s possible. As a writer, rejection is something you have to get used to if you want your work out there. At first you may hesitantly show some writing to a loved one, then you may tentatively show a few more people, if you go to a writing class, you’ll be reading your work to other people there too. These are the baby steps that are often necessary for us to begin feeling like we are actual ‘writers’. Of course anyone can say they are a writer, but I feel it takes a leap into that relationship with a reader that turns tenuous scribblings into something more tangible. Of course we can all journal, write down our angsty/gorgeous/poetic/catastrophic/whatever words, and that’s totally fine if that’s all we want to do, it’s a way of expressing ourselves, just getting it out of our system. But, if you have something to say, it’s good to feel that someone will listen to it. By doing that though, we risk that people won’t like what we write. That we won’t be good enough. I think all writers have that critic on their shoulder at times, the one that says you can’t write, you’re rubbish/boring/predictable, no one will want to read anything you write etc etc, the critic that stops us writing, and keeps everything we do write private. It’s hard to take the risk of hearing that voice from real people – it’s bad enough if we think it, if other people do, then it MUST be true. And the thing you learn, when you do start getting out there, when you do start sharing your work, is that most people will be kind, most people will like something in your writing, but some people won’t. And that is ok. Reading and writing is such a subjective personal thing, that just because someone doesn’t like what you do, it doesn’t mean it’s rubbish. It may mean it needs more work to realise its potential, or they may just not like your style. Of course sometimes there will be things that just aren’t working at this point in time, pieces it’s worth putting to one side, or even abandoning. But that’s just one piece of work, it’s not true for everything you write, and it doesn’t mean you are a crap person. And when it comes to sending your work out for publication and competitions, the rejections come in thick and fast. It’s disappointing when your prize poem doesn’t make it into print, or doesn’t quite get placed in that competition. But it’s important to remember that these are often a numbers game. If a journal receives hundreds of submissions and can only print twenty, or ten, or if that judge has to pick only 3 winners – then you’re more likely not to be successful. It may be that your work isn’t up to the necessary standard, but its also possible that it didn’t quite fit what they were looking for, or they’d had something on a similar theme last issue, or they just didn’t like your style (remember the subjectivity thing we’ve got going on). So I think the message is to take on board constructive criticism, to not take rejection personally, and to keep on submitting. The more you send out, the more you risk rejections, but also the more chance you have of being successful. And on that positive note, I’ll share what sparked the idea for this post. The Wise Words Festival asked people to send in short poems to be selected to be displayed in shop windows throughout the festival, and one of mine is going to be up in Costa’s in Canterbury. So all the time I’ve spent sending things out over the last few weeks has paid off. The deadline for the SaveAs Writers ‘The Bigger Picture’ competition was yesterday. It’s a great idea for a competition; produce a piece of poetry or prose inspired by art about the Great War. 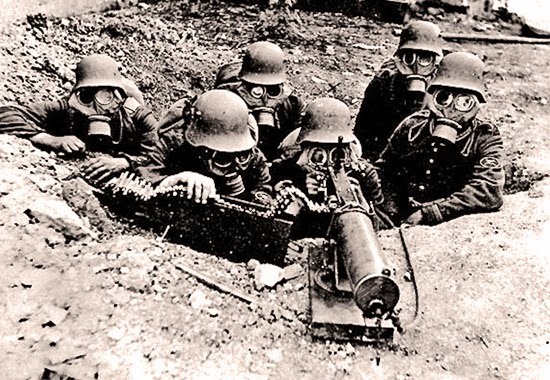 In case you’ve been living in a cave, and have missed all the media coverage, it’s 100 years since the start of the First World War. On 28 June 1914 Archduke Ferdinand was assassinated in Sarajevo, and on 4 August 1914 Britain declared war on Germany. It’s a horrific part of our history that we’re so lucky not to have lived through. And even though it’s so long ago, emotions surrounding it still run strong. It’s incredibly moving looking at paintings, hearing music from the time, seeing films based on events that happened then – the suffering of those who experienced it rushes forward across the years to hit us in the face, to make us stop and think, and appreciate what we have now. The centenary seems to seep into our everyday life. I’ve lost count of the number of conversations that I’ve heard or taken part in around it, it triggers conversations about the Great War, other Wars, personal experience, family traditions. Last week on the beach it led to a woman I didn’t know, telling me that she can’t see Spitfires at airshows without crying, as her dad was involved in secret ops during WW2. She didn’t find this out until after he died. Even talking to me, her voice was loaded with emotion as she said this explains why he was like he was, but at least he came home. And it made me stop, and wonder, how many survivors were damaged to the point that they couldn’t show their feelings, couldn’t be good parents? And how was this translated through the generations, I’m sure children born today are still affected by this. has just finished studying an MA in Creative Writing at the University of Kent. Her poems have appeared in various publications and online. 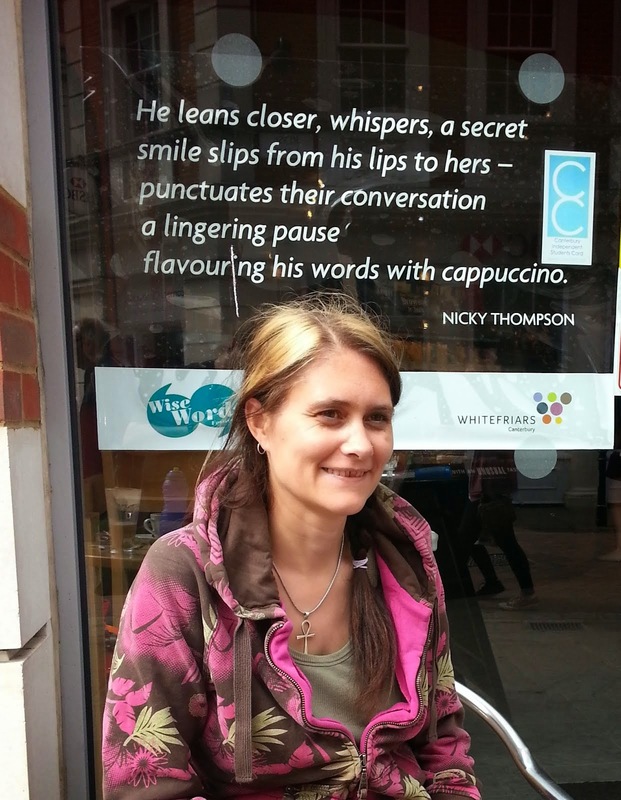 She is a founder member of http://www.wordaid.org.uk/ a Kent-based collective of poets, working to raise money for charity through literature projects. She works as a Community Development Officer, running projects that make a difference to local communities. She lives near the sea in Whitstable, where she walks on the beach every day.